Other than to ply way into my neighbors’ good graces, I had no real reason to make these besides the fact that they are the cutest cookies I’ve ever seen. I only learned about them a few days ago when my friend Kat, of Banana Dream Cake fame, showed me (over Skype, naturally) what she was baking with her mum. I’d never even heard of Empire biscuits before (their name pretty much equates to I Am Not American and a quick search of my go-to, US-based recipe websites came up with nothing) but they looked too adorable not to try. The story that came along with the cookies, though, is what really sold me. After all, a cute red-button nose was not going to convince me to spend the better part of an afternoon in front of a hot oven in the middle of the summer, no matter how bright. As Kat tells it, the 91-year-old recipe came over from Scotland when her grandmother emigrated in 1932. 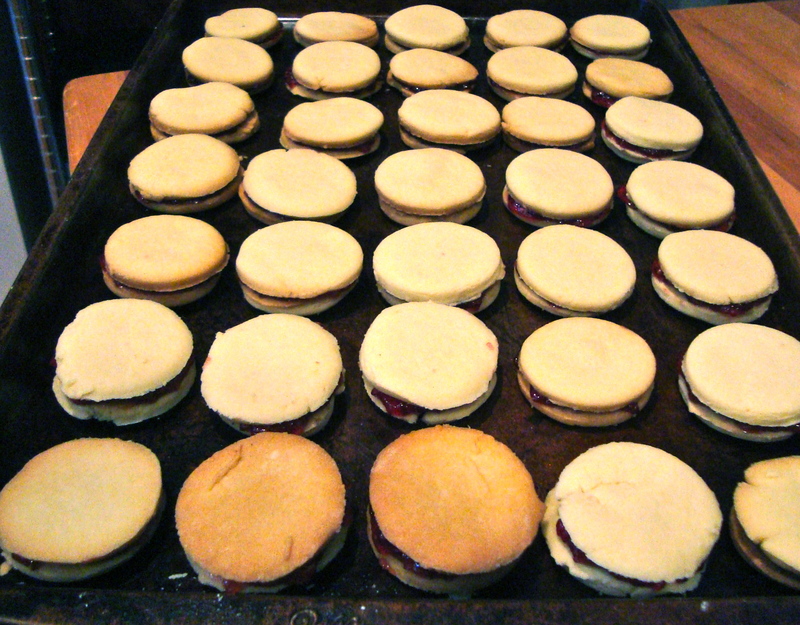 It’s long been a Christmas tradition in Kat’s family: this year they made 12 dozen empire biscuits. Intrigued by the romantic origins – young girl, big boat, recipe in pocket – I looked up Empire biscuits and it turns out they have quite a story all their own. 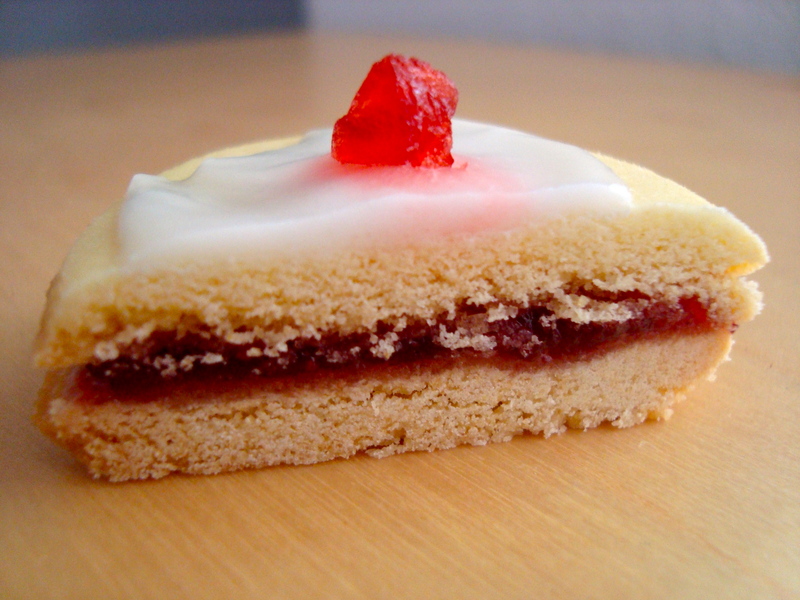 The Empire was originally called the Linzer biscuit (because of its resemblance to the Linzer torte) or the German biscuit, a name which, after the start of World War I was, like French Fries after it, irreversibly tainted. 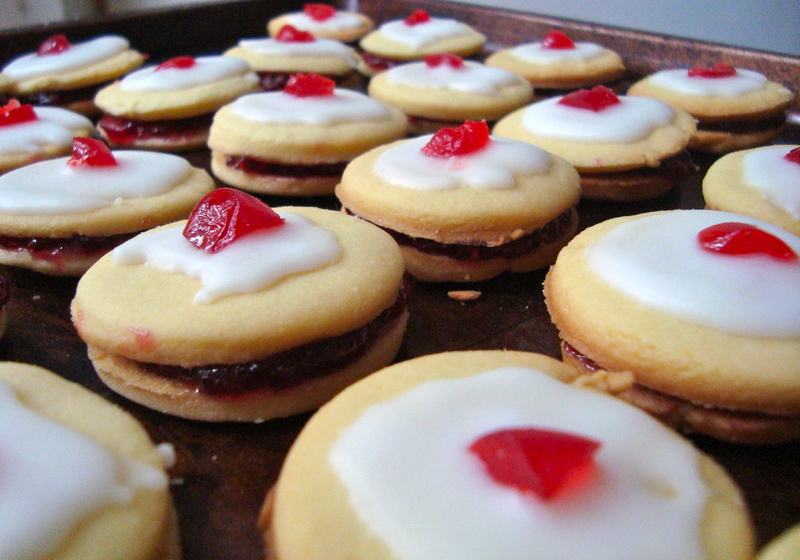 Never ones to say no to a demonstration of nationalistic pride, the Brits renamed the cookie the Empire biscuit and so it lives on. 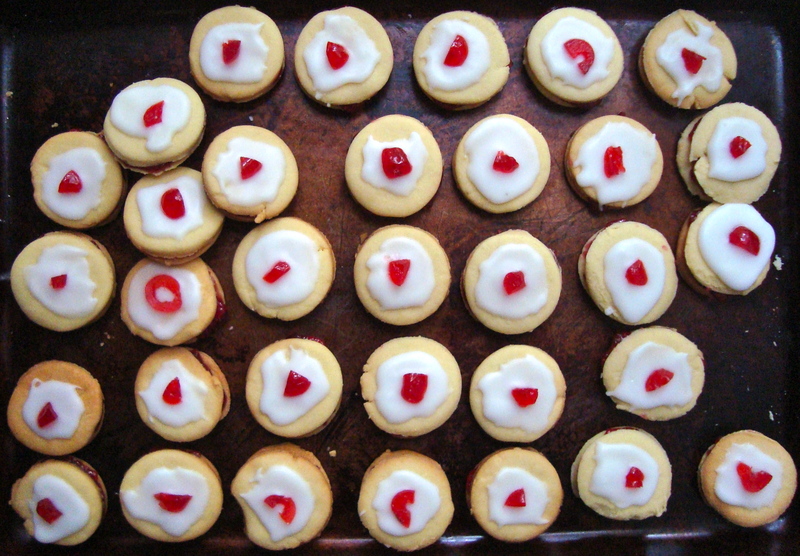 Common throughout the empire commonwealth, it’s especially popular in Scotland, where it’s still considered a traditional treat (and, in a true show of Scottish irreverence, still occasionally called German biscuit). And I see why the tradition has lived on despite politically motivated name changes, emigration and development in general. They’re really, really tasty. 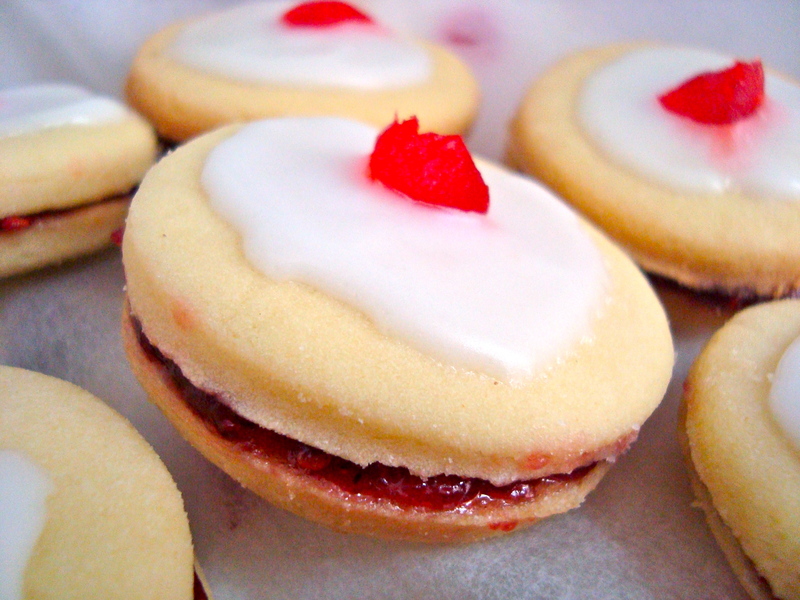 A spoonful of raspberry jam sandwiched between two perfectly simple shortbread cookies topped with a simple icing and a sliver of maraschino cherry. A bit of online perusing showed me there are endless variations on this simple recipe, but I chose to loosely follow Kat’s grandmother’s, which calls for a tiny but essential drop of almond extract in the icing. The method, though, was mostly of my own creation because Kat was nowhere to be found on Skype and the instructions – “Cream butter and icing sugar in large mixing bowl. Add baking soda & cream of tartar, then gradually mix in flour. Chill dough for ½ hour. 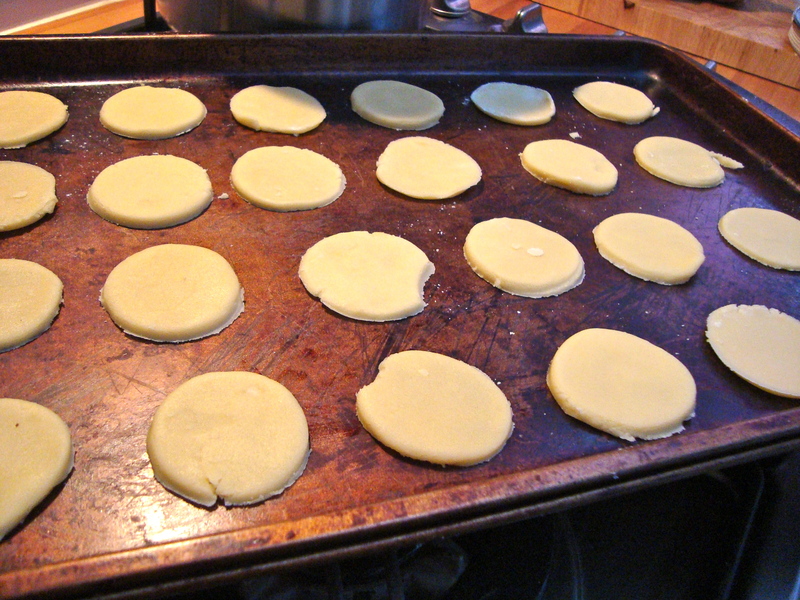 Roll out (1/8 inch thick ) and cut into 1½ inch rounds” – completely left out the egg listed in the ingredients. What did I do? Started bombarding Kat with Skype messages until I finally gave up and added just enough beaten egg to bring the dough together. I also didn’t add the cream of tartar because I didn’t know if I was adding the egg until the end; I used salted butter because I always do; and I baked them for less than what was called for. So. I took a recipe carried across the Atlantic Ocean, handed down generation to generation, dutifully prepared each year at Christmas, and what did I do? I didn’t really follow it. But you know what? That’s OK. In the process, I made my own variation on a recipe that will undoubtedly live on long after the Empire. Oh, wait. It already did. These are the PERFECT Christmas cookie. But I wouldn’t say no to them any time of year. Thanks, Kat, for another keeper of a recipe; and thanks, Kat’s grandma, for keeping the tradition alive. Makes about 36 cookies. Store in an air-tight container or eat immediately, whichever you prefer. Cream butter and icing sugar in large mixing bowl with electric beaters. Add baking soda then gradually mix in flour. Beat the egg into a small bowl. 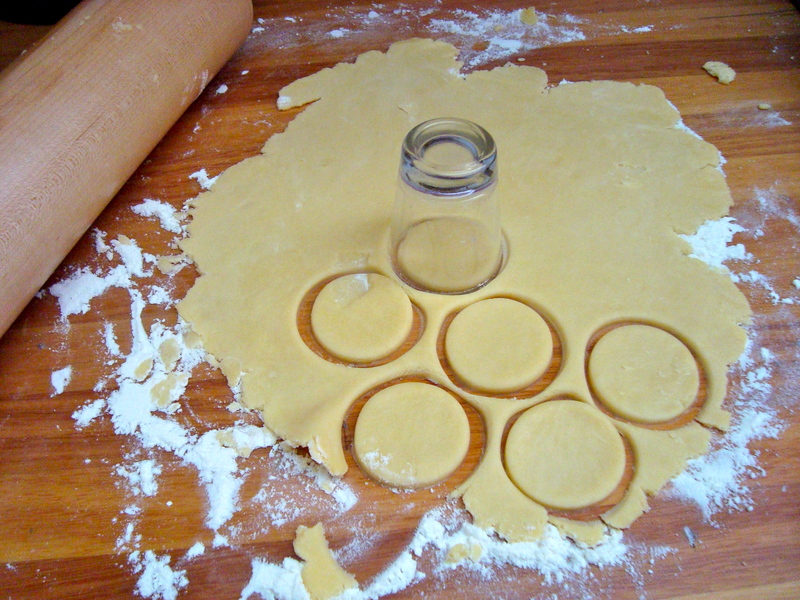 Gradually add the egg until you can easily form the dough into a ball with your hands. Form into a ball and wrap in plastic wrap. Chill dough for ½ hour. On a lightly floured surface with more flour on hand in case dough sticks, roll out (1/8 inch thick) and cut into 1½ inch rounds (I used a shot glass. What?). 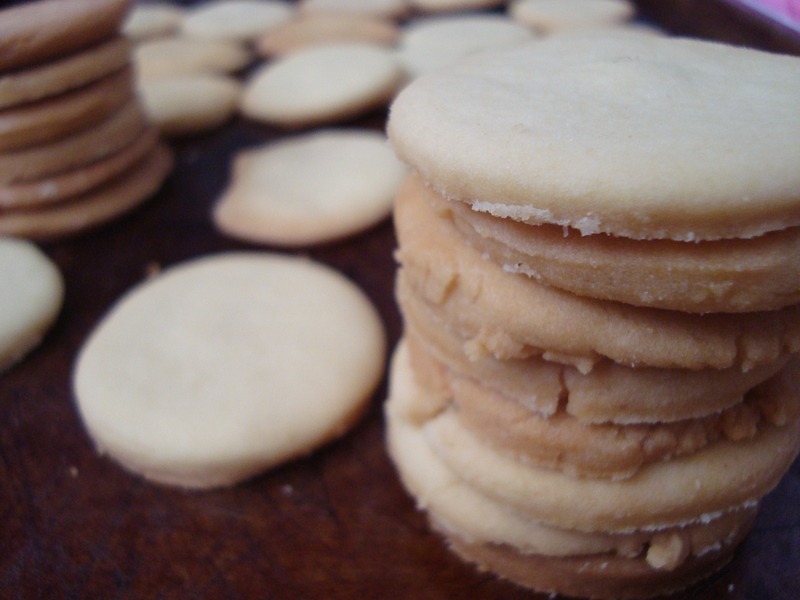 Bake at 300F/160C for 8 – 10 minutes, making sure that cookies are very lightly baked and appear white & crisp. 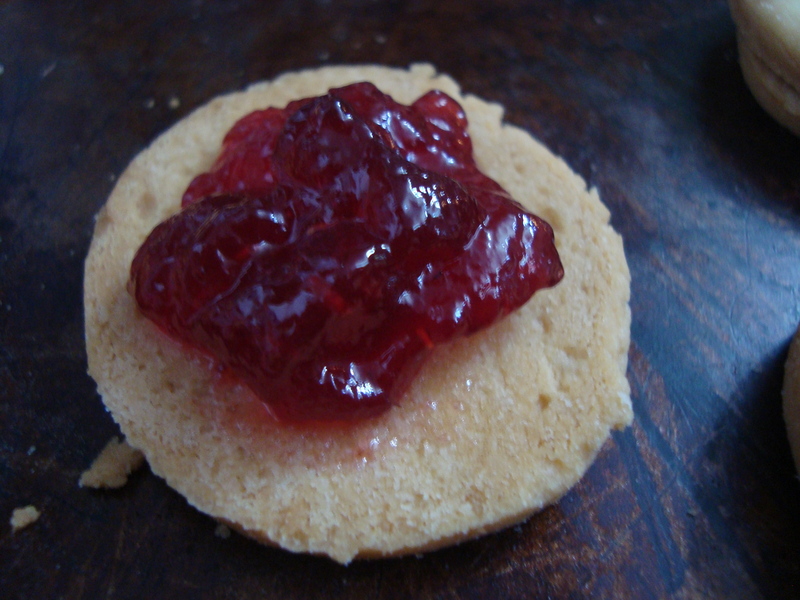 To assemble, put ½ teaspoon of jam on one round and top with another round. 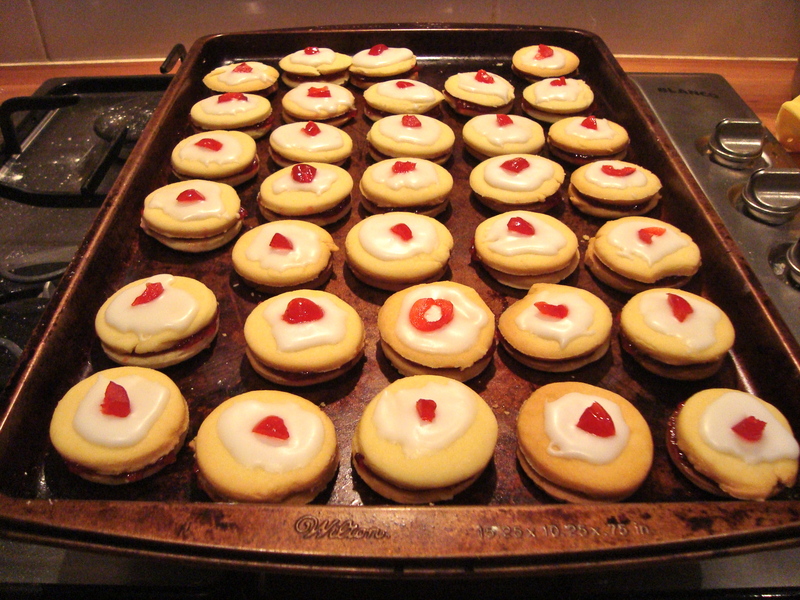 Put 1 teaspoons (or less) of icing on top of each cookie, and while the icing is still wet, place a piece of a red cherry on top. Stored in an air-tight container, they’ll keep for upwards of a week, longer if you keep them in the fridge. Sooo beautiful…and so Scottish! I definitely recognize these from many childhood events. Sue made these today – they are perfect. like a mini strawberry shortcake when cut in half!